The iSeries server provides leading edge support for hosting Java based web applications. It provides both an HTTP server and a web application server. This session covers using WebSphere Studio to build iSeries server side Java applications. It discusses using a layered architecture design that allows for the separation of application components. This promotes application designs which are highly reusable, scalable and maintainable. Design patterns are recurring solutions to software design problems. The Model-View-Controller (MVC) design pattern is often used to design layered web based applications. It promotes the separation of the application into distinct and maintainable components. In this session, WebSphere Studio is used to produce an application which demonstrates the implementation of the MVC design pattern. Java servlets, JavaServer Pages, JavaBeans and Enterprise JavaBeans are discussed as part of the application development scenario. 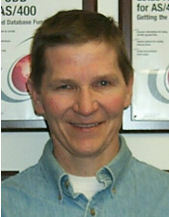 Bob Maatta has been a faculty member in the School of Business and Economics at Michigan Technological University in Houghton, Michigan since 2002. He teaches classes in Java programming, telecommunications, and e-business application development. He is a Sun Certified Java Programmer and a Sun Certified Java Developer. Prior to his current job, he spent over 25 years working for IBM Corporation in Rochester, Minnesota. While at IBM, he was recognized as a world wide expert on iSeries e-business application development with the main focus on WebSphere Application Server, Java programming and application development. At the time of his retirement from IBM in 2002, he was a Senior Software Engineer at the IBM International Technical Support Organization, Rochester Location. He was the ITSO technical leader for iSeries e-business application development. He writes extensively and developed and taught IBM classes worldwide on all areas of iSeries client/server and e-business application development. He is the lead author of numerous IBM redbooks that deal with various aspects the iSeries application development.